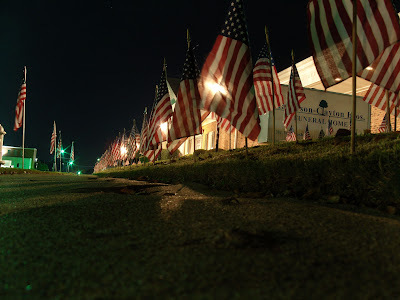 this photo was taken in front of Anderson Clayton Bros funeral home, where American flags line the front sidewalk and street in honor of SSG Shawn McNabb who passed a little over a week ago while serving our country in Afghanistan. 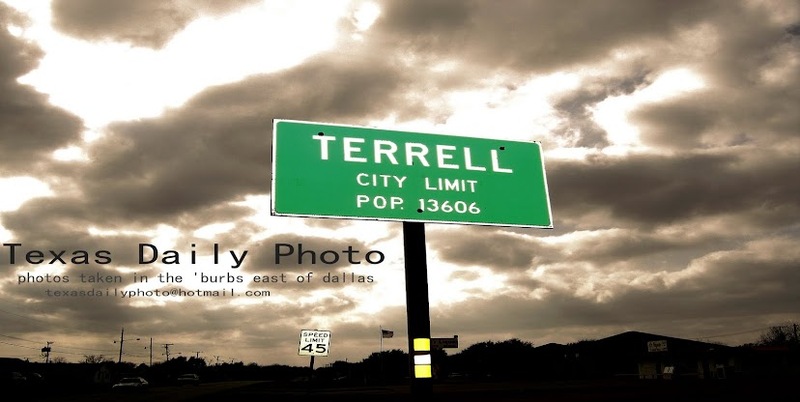 Funeral service with full military honors will be 10:00am, Friday, November 6, 2009 at First Baptist Church in Terrell, Texas, 403 N. Catherine, Terrell, Texas, 75160 with interment to follow at D/FW National Cemetery in Dallas, Texas. The family will receive friends from 4:00pm to 9:00pm, November 5, 2009 at Anderson Clayton Bros. Funeral Home, 301 W. Nash, in Terrell. Some additional information regarding the incident in which this local hero lost his life can also be found here at the Military Times website. Unbelievably sad. One of those accidents that really leaves you shaking your head. The row of flags is impressive to say the least. Nice post Brian. P.S. Glad you liked the link. Lots of great stuff there. Brian I love the fact that you got a shot that I haven't seen anything like. It's hard to be an original and you nailed it. Kudos!